Lightning Experience is not just a shiny new looking version of Salesforce Classic. Nor is it just some new cool technology for building device agnostic responsive rich clients. Its a single place where users access your application and of course others from Salesforce and those from AppExchange. Its essentially an application container a home for apps! Like any home, its important to know how it works and how to maximise your experience in it. How do you make the occupants (your users) feel like its one place and not just bolted together. I decided to create the following graphics to summarise Lightning Experience container features. I have removed all the default actions, components you get from Salesforce, so we can easily see what it offers in a raw state. The Home page is actually shared between all applications in Lightning Experience. You can choose to include it in your tabs or not. If you do, users can customise it with Lightning App Builder by dragging Lightning Components on it that you or others provide. 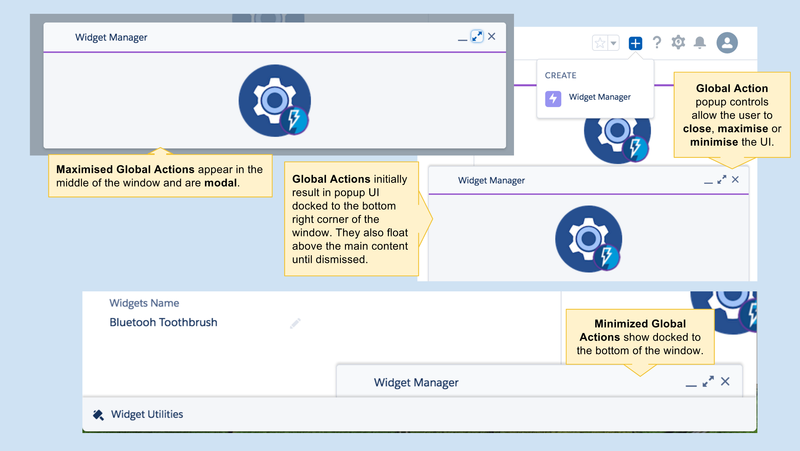 New to Global Actions for Spring’17 is the ability to add Lightning Actions. When you see the cog image with the Lightning logo in it, it means that that space can be anything you imagine! Because that space is driven by a Lightning Component! 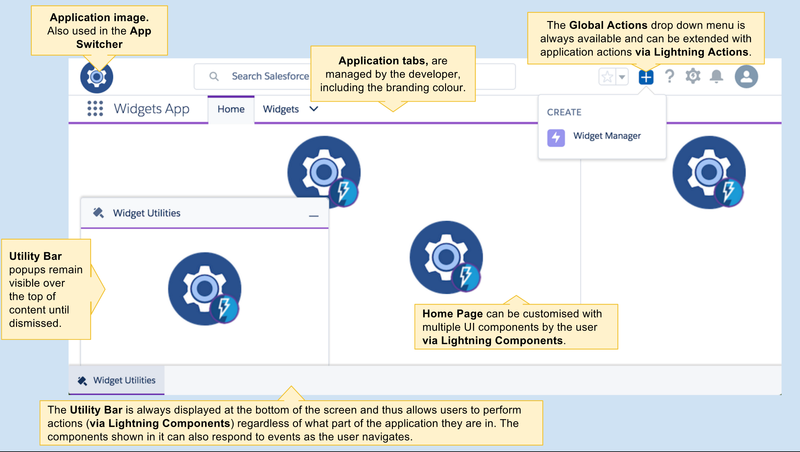 When the user selects a Global Action, Lightning Experience automatically provides some useful features. The popup allows the user to close it, minimise or maximise it. 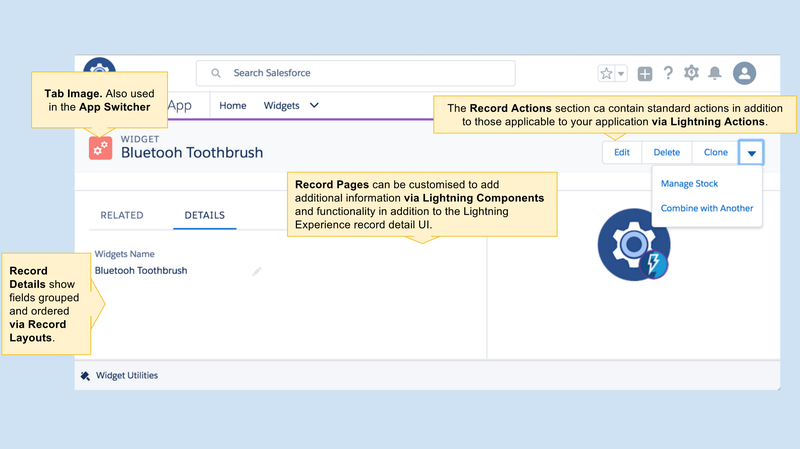 Record page content is determined by a number of things, object Actions, object Record Layout and Lightning pages (created by Lighting App Builder) associated with the object. Lightning pages are scoped based on the active application, profile or record type. Provide the biggest real-estate for your entirely custom UI needs. The utility bar and global actions are however still available for your users to call on at any time! Increasingly in each Salesforce release we are seeing more and more extensibility emerging. The above graphics are designed to get you thinking about how best to leverage Lightning Experience when designing your application. Read my other blogs relating to Utility Bar and Lightning Actions. Categories: Lightning, UtilityBar | Permalink.